My previous Blog was about the welcome appointment of Stefan Berger as BPP Bundespruefer for Armenia. The above cover is an example of why we need him. It's on offer right now from a major auction house who point to the amazing Inverted Overprint at top right of the cover. This overprint has also excited someone else, who - thinking that the envelope is just a piece of scrap paper - has scribbled "Inverted" in English at top left. Catalogue numbers have also been scribbled and it might be possible to work out which catalogue was being used when and where. The cover is an old-fashioned fake. The three 100r overprints are fake and the ERIVAN cancel is a well-known fake showing a date 24 1 21 which would be very, very rare for an Armenian letter. This fake cancel was already known to Tchilingirian and Ashford in the 1950s. 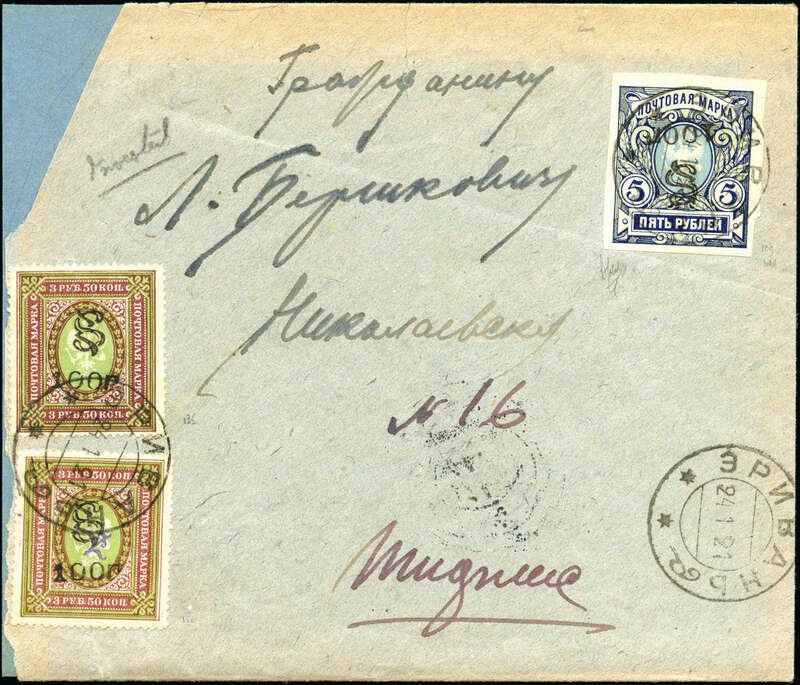 The envelope is old but I hesitate to date the Cyrillic address - the letter is supposed to be going to Tiflis. There is something about the handwriting I don't like but I can't put my finger on it - apart from the fact that the address seems to have been written in two separate attempts in two different inks. Two things are interesting. The stamp at bottom left does have what looks like a genuine unframed "Z" overprint in violet - not rare - to which the fake 100r has been added. And at the top right there is a pencilled signature at the bottom left corner of the stamp, done Italian style. What I would like to know is whether this is a genuine expert signature applied by someone who did not know what they were doing or whether it is a faked piece of expertising.